Instagram offered an update on how brands are using the Marquee feature it introduced last month. In September, Universal Pictures Home Entertainment ran a Marquee campaign to drive awareness of its home entertainment release of Fast and Furious 7 on Blu-ray, DVD and digital HD. They used three videos leveraging customized high-action scenes from the film tailored to males 18-plus in the U.S.
With its one-day blast campaign, Universal Pictures Home Entertainment received millions of video views and the highest video completion rates it has seen to date. Its Marquee ads garnered a 26-point lift in ad recall and a seven-point lift in awareness among its target audience, with even higher results among males 18 through 34. In addition to raising mass awareness, it drove purchase intent and sales with its campaign, helping make Furious 7 one of the highest-grossing live-action DVD, Blu-ray and digital HD releases of the year. And entertainment brands aren’t the only ones taking advantage of Marquee’s mass reach. In Asia, Sony Mobile Hong Kong wanted to promote the release of its C5 and M5 phones in a major way. So it turned to Instagram to build out a series of campaigns surrounding the launch. To drive awareness of the phones and their functions, Sony ran three separate Marquee ad campaigns—one week apart—over the course of three weeks. Then, to increase sales of its new phones, it ran a series of images ads through Instagram’s self-serve interface with the call to action “learn more” taking people to its site. At the end of its three-week campaign, Sony saw great results. It received a six-point lift in awareness of its Sony C5, a six-point increase in message association and a 43-point lift in ad recall among its target audience. 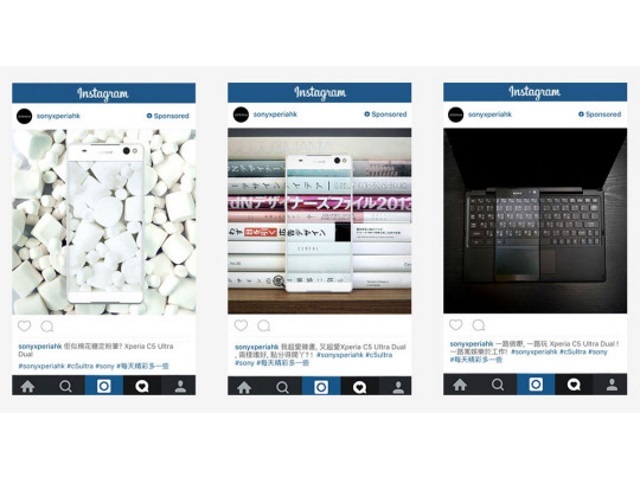 Instagram advertisers: Have you looked into Marquee?